California Dates have been grown in the United States since the turn of the century. 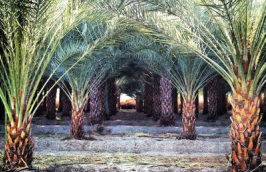 The Coachella Valley has the ideal climate for growing the highest quality of dates in the world. 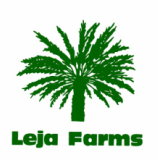 Leja Farms began farming in 1960 and is proud to offer gourmet Medjool and Deglet Noor dates. Delivering a quality product to our customers has always been a priority. Dates are the perfect fruit for combining nutritional value and excellent flavor. Leja Farms remains dedicated and committed in providing farm fresh dates from our family to yours. Deglet Noor Natural Dates - Natural, semi-soft, amber in color, whole date, 25% moisture content. 48 to 52 dates per pound. Contains pit. Deglet Noor Hydrated Dates - Hydrated, moist, amber in color, whole, 20-25% moisture content. Deglet Noor Pitted Dates - Hydrated, moist, amber in color, pit mechanically removed, 20-25% moisture content. 58+ dates per pound. May contain calyx, pit, or pit fragments. Seeded and Chopped - Mechanically extruded Deglet Noor date product, 3/8" round x 3/4" long, covered in oat-flour, moisture content maximum 15%. May contain calyx or pit fragments. Mascerated Dates– Mechanically manufactured from soft dates. Excellent flavor and texture. Versatile product for baking and milk shakes. Moisture content 17-22%. Medjool Jumbo – Natural, sweet, moist and meaty, naturally cured and toweled to enhance its natural glossy appearance and texture. 15 to 20 dates per pound. Contains pit. Medjool Fancy – Natural, sweet, moist and meaty, naturally cured and toweled to enhance its natural glossy appearance and texture. 20 to 25 dates per pound. Contains pit. Medjool Choice – Natural, sweet, moist and meaty, naturally cured and toweled to enhance its natural glossy appearance and texture. 26 plus dates per pound. Contains pit. Honey – Natural, sweet, soft, golden-amber in color. Deep honey like flavor. 55 plus dates per pound. Contains pit. Barhi – Natural, sweet, soft, dark-amber in color a melt-in-your-mouth delight. Leja Farms recommends refrigeration for all of their dates and date products. Dates may keep over a year if properly stored. For optimum preservation, California Dates are better stored in a tightly sealed container; refrigerated (between 32 and 40 degrees F., 50% - 70% relative humidity) or frozen. Refreshing or rehydrating whole or pitted California Dates after a long storage; immerse in water (80 degrees F.) for about 20 minutes allowing water to absorb. Remove and pat dry with a paper towel.